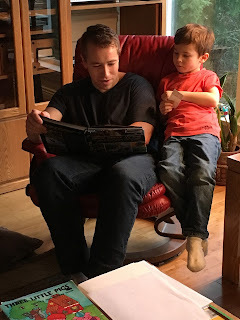 On Sunday, I got to be Grandma all day long. My two little grandsons came over to our house for the day while their parents went skiing. Although I have babysat them a number of times at their house since moving here, and although they have been to our house many times with their parents, this is the first time that I have had them here all day. 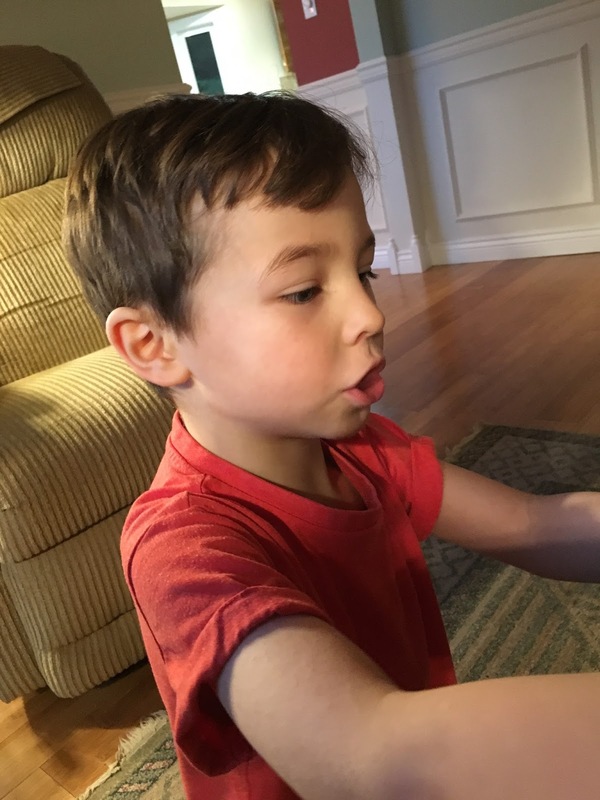 Their mom said that they were excited and eager to come stay at Grandma's house. We started the morning right. Grandpa made his signature pancakes (yup, Aunt Jemima). 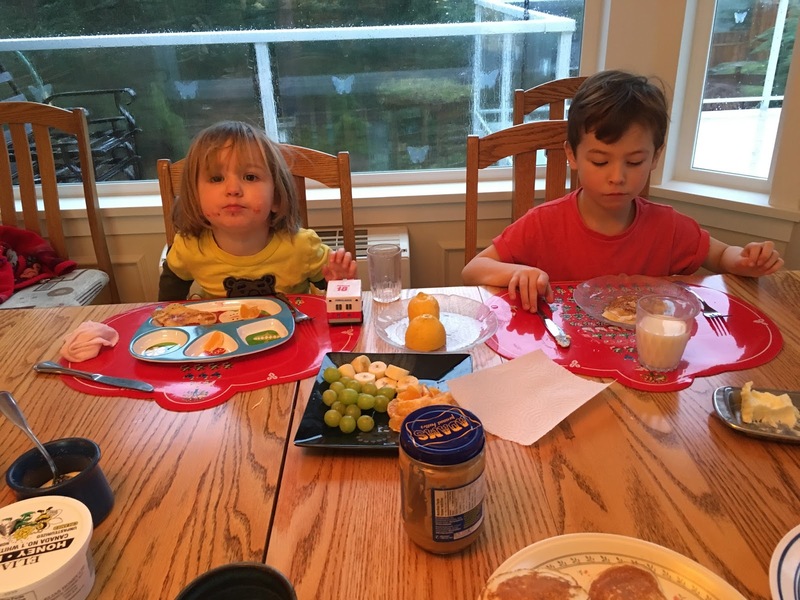 Both little boys ate many, many pancakes. It was a windy, stormy day, so we stayed indoors rather than venturing out. 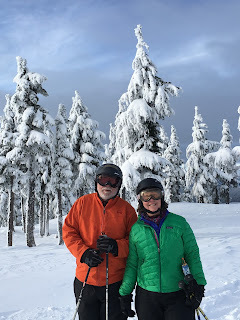 The weather was a bonus on the ski hill -- lots of fresh powder for my daughter and son in law! 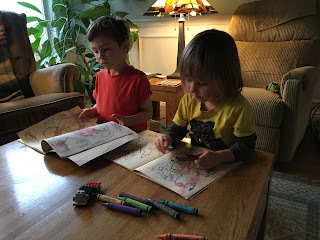 We coloured and drew pictures (art for my fridge), read stories, played with LEGO and Grandma's toy stash, and played with stickers. The younger grandson was very pleased that he had his own little bed to sleep in when nap time came (a fold-out cot that I set up in the spare bedroom). Another big hit of the day was baking cookies. 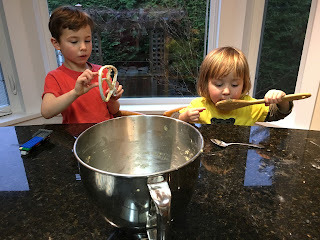 Actually, licking the beater and spoon at the end of the cookie-making was the part that the boys enjoyed the most. They also really liked eating the chocolate chip cookies, after they cooled off. A tin of cookies went home with them at the end of the day to share with Mommy and Daddy. Their uncle spent lots of time in the afternoon playing with them. 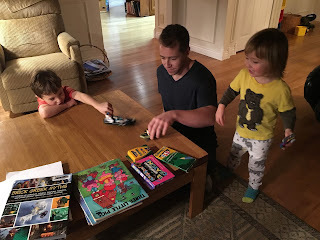 They adore their uncle! 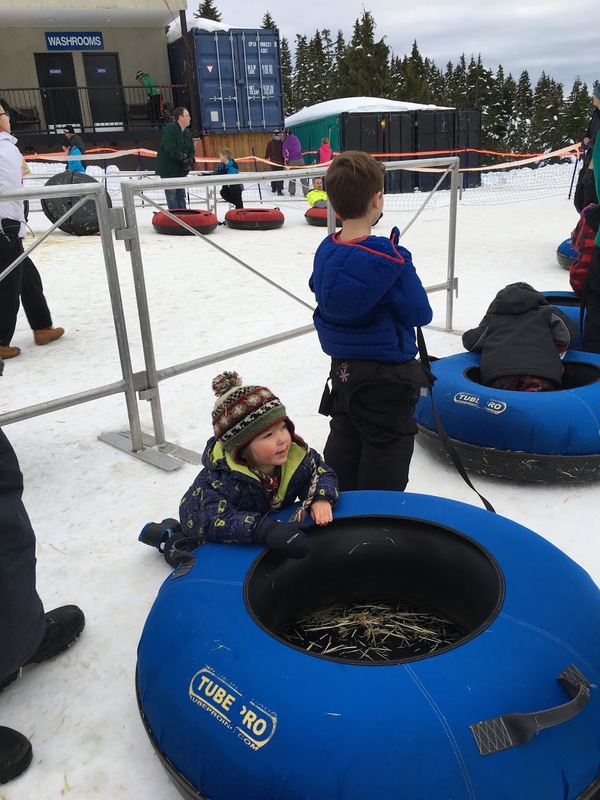 Everyone had a terrific day -- Mommy and Daddy at the ski hill, the two boys at Grandma's house, and Grandma, Grandpa, and Uncle. Even our dog, Kate, was totally delighted to spend the day with my grandsons. 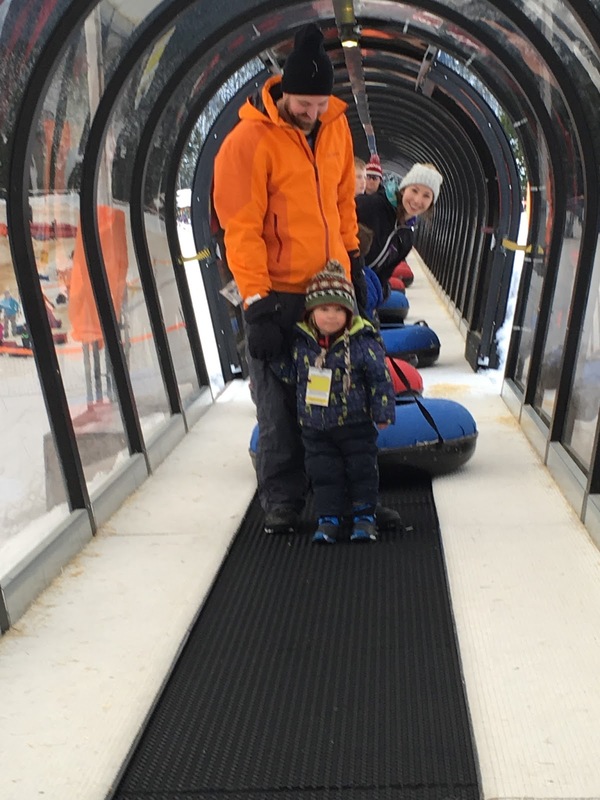 The previous weekend, I went with my grandsons and their parents to the Tube Park at the ski hill. It was fun, and the boys loved it. 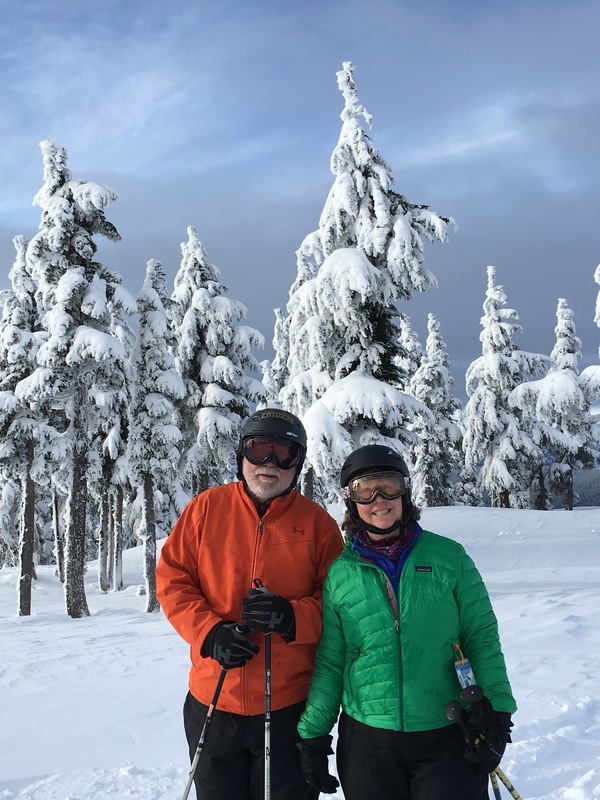 Yesterday, Rob, my son and I had our own ski day. We couldn't have timed it better. We had sunshine and fresh snow. Retirement is awesome! I can't even remember why I was so worried about it. Your pleasure in your grandchildren comes through loud and clear in this post, Jude. I enjoyed sharing in that, but the very best part for me was your final thought - "Retirement is awesome! I can't even remember why I was so worried about it." Yes! What a fabulous transition you are making or have made - not sure where you are in that, but wherever it is, it's clearly where you're meant to be. I'm really happy for you. Thanks Karen! 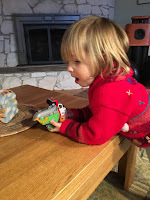 I have have to say, the love for one’s grandchildren is a very pure and special kind of love, even though it is not always easy to figure out the grandparenting role. I suppose that can be said for any kind of familial role, though. And yes, I love retirement. I cannot imagine going back into the workplace full time. I still have some involvement in my career from the sidelines though. I am still doing some research, writing, reviewing and conference presentations — although at a much reduced level from in the past. So, I haven’t fully transitioned. Haha! I loved your last sentence. I bet there are many people out here in blog land saying "I told you so!" I guess there are certain life experiences that one just can’t really understand fully until experiencing them. Retirement is like that for me. Your 'Grandma Day' looks and sounds amazing, Jude. I can't wait to hear more about this in person. Soon! Hi Donna. We’re looking forward to seeing you next week too. Isn’t it nice to be living close enough to each other to visit in person as well as on the screen? Your 'Grandma Day' and ski day look perfect, Jude! and to be able to see Donna in person? Awesome! Hi Natalie! Yes, I know I am super lucky. I guess that research on happiness showing that “young” seniors are one of the happiest age demographics is turning out to be true for me. It’s cool that Donna and I now live close to each other!